Mom, the Intern: She sushis. Try saying that one five times fast. I really love sushi. Fresh, high-quality, authentic sushi. Not crappy sushi from the Baltimore Airport. Let's just say a 5-hour flight to Phoenix is not made any easier by bad sushi. Some people think sushi is gross. If this is you, I won't criticize because heaven knows I despise some foods that many people find delicious. My number one most hated food ever is celery. Don't get me started. I know, what a weird food to hate, right? But I've tried it 100 different ways and I still find it absolutely wretch-worthy. Even coated in peanut butter. ESPECIALLY coated in peanut butter. But I digress. Sushi isn't for everyone. But before you rule it out entirely, let me first debunk some sushi myths for you. 1) Sushi is raw fish. Not always! 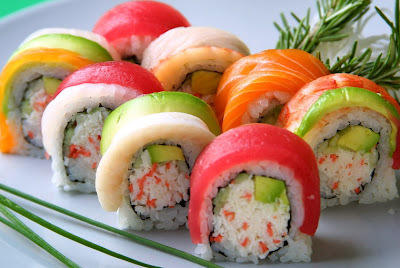 There are mainly two kinds of sushi: nigiri and maki. Nigiri is most definitely raw fish sushi. Take a gander at the picture up there -- see it? It's a little slice of (heaven) raw fish on top of a ball of rice. Not much to it, but I think it's delicious. My favorites are salmon and tuna. There's also sashimi which is a slice of raw fish all by itself -- no bed of rice, no seaweed, nothing. Just fish in its birthday suit. See those little rolls? That's probably what you imagine when you think of sushi. 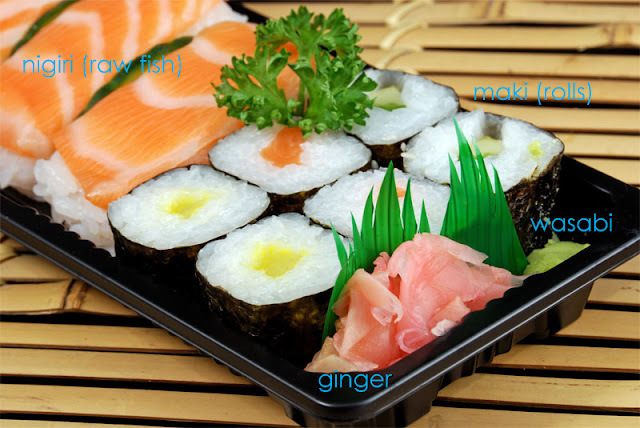 Those, called "maki," aren't always comprised of raw fish. Perhaps you've heard of a California roll -- those contain avocado, cooked crab or imitation crab and cucumber, which is stuffed inside a thin layer of seaweed and rolled in rice. No scary raw meat to be concerned with. There are also lots of vegetarian and cooked fish rolls similar to the California. When in doubt, ask your waiter. 2) I hate cooked fish -- why would I like it raw? Well, I'm no expert, but I've found that raw fish tastes nothing like its cooked counterpart. I find it cool, refreshing and light. No "fishy" flavor like you might find with grilled or baked fish. So, just because you don't like cooked fish doesn't mean you won't like it raw. 3) Sushi is chick food and won't fill me up. Plenty of men enjoy sushi regularly -- it's not girly food. However, Dill decided that sushi is much like a chick flick -- he enjoys eating/watching it, but he would never choose to eat/watch it and probably wouldn't do so without me. And definitely not with other guys. Dill much prefers a big steak dinner to sushi, but he still enjoys it with me. This is a rainbow roll platter. That is definitely raw fish on top, either tuna (red), yellowtail (yellow) or salmon (orange). I also see a sliver of cucumber. The next layer is rice, followed by seaweed and stuffed with avocado and crab. This platter would probably cost about $10 at a reputable restaurant. See, not bad! I'd be pretty full if I ate that whole thing. Not to mention most sushi joints give you a complimentary salad, soup or noodle bowl before your main course. *Go with experienced sushi-lovers so they can recommend a reputable, authentic restaurant and help you order. This also allows you to order a lot of different types and try them all to see what you like best. Many people enjoy going to eat sushi in large groups for this reason. *Use the provided wasabi, soy sauce and ginger to further flavor your rolls if desired. Wasabi is spicy, ginger is ... ginger, and soy sauce is the brown, salty stuff used in most mainstream Asian cuisines. I usually do a little of everything, but some rolls stand on their own just fine. *If you can't use chopsticks, ask your waiter for a fork or "trainer chopsticks" (fastened together with a rubber band). I've had sushi about 10 times and still don't really feel comfortable with legit chopsticks. No biggie. However, sushi is rather delicate and chopsticks allow you to handle the pieces without smooshing them to smithereens. So ask for the trainer ones. *Make sure you eat everything on your plate -- in Japanese culture, it is considered rude to leave food behind! Sushi is as much art as it is cuisine; the chefs pay close attention to make the plates beautiful AND tasty. If you absolutely can't eat it all, take it to go. But don't leave anything on the table. It's insulting. *Most sushi restaurants also have some sort of a la carte menu for teppanyaki (fried meat entrees), salads and soups. So if you get to the edge of the diving board but don't think you can dive into sushi after all, order from there. Can't go wrong with panko-crusted fried chicken, amiright? But as they say on Yo Gabba Gabba: "Try it -- you'll like it!" You can't fairly assume something is gross unless you have tried it. I will say I never though I'd eat eel in my life, but I ordered the crunchy eel roll last night at Sakana and was in heaven. So you just never know! Mmmm...Sushi. I do enjoy it, but I'm not a huge fan of nigiri. However I do love me some octopus sushi! Perhaps I shall have Matt go get me some that's pregnancy safe! I so want to be a fan of sushi, but for the most part I'm not. I think that it still tastes fishy. But that's also because of the seaweed. The best sushi I had was at this amazing place in SLC called Takashi. It's really expensive. But I think the more you pay for it, the better it is...typically...not across te board. Ryan LOVES sushi. Another tip, because the seaweed does add a fishy taste, there are other things you can roll your sushi in. I think there is soy paper? You are KILLING me! I am nearly 8 months pregnant and I have to forgo many of my favorite rolls because they do contain raw fish (a common pregnancy no-no). My husband and I both LOVE sushi any way they spin it. As soon as this baby comes out I am going to celebrate with a night out at a sushi house. I hope this post helps nervous people to give sushi a try. It's so worth it (at the right place of course, like you said). When we got married, my husband was the sushi fanatic and I was anti. However, once we moved to Provo and found Demae (is that still there?) I was HOOKED. Half price Tuesdays were my favorite. Mama loves sushi now. Still not the worlds biggest nigiri fan, but I'll take almost any roll as long as the spice isn't going to set me on fire. I love love love sushi and yes a good place makes a huge difference. If you order enough rolls it is totally filling- I usually leave regretting the last one I ate as it is so good but I was already full. My husband had a group of friends that would go out for a guys night out once a month for sushi- and these weren't girly men. We would go out to sushi more often if it wasn't o expensive- we usually end up paying anywhere between $60-$80 for the two of us depending on the place. It seems so weird, but I crave sushi. I rarely crave anything. 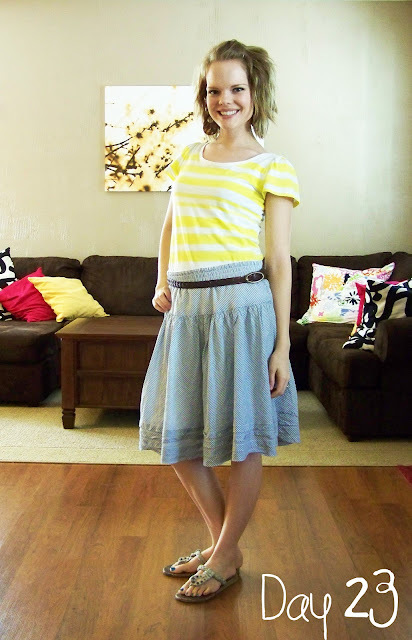 You look darling as always Jenna! Sushi is my favorite! 5ohHubby actually loves sushi too (lucky me). We found a local place that is like a dude's sushi joint, so if he gets to pick, thats where we go. @angela, I thought of that the second I hit "Post Comment". I remembered when Clint mentioned how you want to like fish but can't and then I felt badly. We'll have to double date sometime anyway -- just not for sushi! Haha.